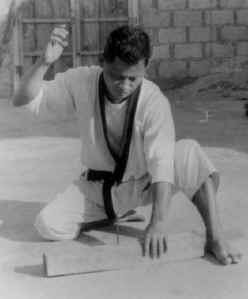 Chinkuchi may have been responsible for Tatsuo Shimabuku's incredible ability to drive a nail into a block of wood with his fist (above). A.J. Advincula's face beams and his eyes sparkle when he recalls to his his students how legendary isshin-ryu karate founder, Tatsuo Shimabuku could drive a sixpenny nail through a two-by-four with a shuto (knife-hand), hammerfist, or even the heel of his foot. With expressions of awe and amazement, the students question Advincula as to how this was possible for a man barely five feet tall, and weighing only 125 pounds. Advincula explains that Shimabuku was able to perform these feats because he understood and used the power of chinkuchi (pronounced chin-coo-chee, and meaning sinew, bone, and energy). What is this mysterious chinkuchi? Advincula, who often heard Shimabuku use the term when he trained with the late master on Okinawa, claims chinkuchi probably originated in China and was later brought to Okinawa, as was much in the way of Chinese martial arts and culture. Normally, Shimabuku would use the term when explaining and demonstrating sanchin kata (isshin-ryu's dynamic-tension breathing form), but he also used it as other times, including during kumite (free fighting) sessions. According to Advincula, Shimabuku would frequently state that judo practioners didn't understand chinkuchi, but that kendo (way of the sword) stylists did. Shimabuku clarified this statement by demonstrating with a bokken (wooden sword), saying that one not only strikes down and in simultaneously, eliminating unnecessary follow-through and thus maintaining proper balance. This results in focused, controlled energy specifically where it is needed. Advincula claims chinkuchi is not absolutely essential to your karate training, but if you desire maximum efficiency, it is mandatory. One of the best examples of chinkuchi at work can be found in isshin-ryu's sanchin kata. Shimabuku used sanchin as a tool to develop tremendous internal energy (ki) that can be generated through proper breath control and body management. To fully understand chinkuchi, however, you must also understand a few important components of Okinawan karate that constitute its makeup. These are: ki, control, and centering. Chinkuchi can be any or all of these components, working together or alone to culminate in tremendous, controlled energy. Ki is an essential ingredient in chinkuchi, because without bursting energy, punching, kicking and blocking techniques are weak and ineffective. Ki is an instantaneous burst of energy, generated in the center of the torso by proper body manipulation. It is similar to a sudden burst of electrical current. Shimabuku taught that ki was used not only for punching and kicking, but could also be summoned to any part of the body for focusing or blocking a technique. For example, if an assailant were to strike your arm with a club, maximum energy could be brought to the arm a split second before impact, protecting it form the blow. Shimabuku stressed that high-level isshin-ryu stylists could bring maximum energy to any part of the body it was needed. This theory is in contrast to Okinawan goju-ryu practioners, who emphasize that energy should be evenly distributed throughout the body at all times, as one is never certain where a blow might land. Another example of chinkuchi is demonstrated in sanchin kata as performed by goju-ryu stylists. In goju, the thighs are deliberately brought close together and tightened, using dynamic tension to protect the groin from rising kicks. However, as stated, goju stylists are also noted for being able to simultaneously produce equal amounts of energy throughout the rest of the body. Isshin-ryu founder Tatsuo Shimabuku testing Sensei Advincula's sanchin stance. There is another important aspect of ki which is important to remember: it can be used against you! And not just in aikido, as some think. According to Advincula, karate stylists can also use an opponent's energy or ki to advantage. One example is found in goju-ryu, where the ju (soft) techniques are emphasized, such as circular blocks that flow with an opponent's energy. Many people believe Okinawan karate emphasizes force against force, but Advincula claims this is merely an illusion. Although younger instructors many times emphasize strength, often utilizing devices and weights to enhance the upper body, older instructors usually stress softer techniques. The tensho kata of goju-ryu is a perfect example of a breathing form which emphasizes a softer approach, and it is very popular among older students. Proper control of punches and kicks is paramount in the martial arts because uncontrolled techniques drastically affect an individual's balance, leaving one open and vulnerable to attack. Shimabuku used the term chinkuchi when demonstrating control. For instance, he would have a student thrust a fist slowly but firmly against the palm of his hand. Suddenly, Shimabuku would release the resistance and usually the student would lurch forward. Shimabuku would then exclaim in broken English "No chinkuchi, no chinkuchi." In other words, he student didn't have control of his technique. In the united States, it is common to see tournament fighters throw wild, inaccurate spinning kicks, their bodies turning almost completely around. In other instances, competitors can be observed falling against the ropes or onto the floor after having failed to execute a technique. By contrast, rarely does one see a contestant overextend or go wildly out of control after missing a punch or kick in tournament bouts conducted on Okinawa. Why? Because chinkuchi is used in many styles of Okinawan karate, such as, goju-ryu, kempo, isshin-ryu, and many branches of shorin-ryu. 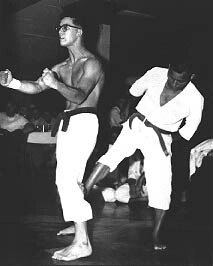 Shimabuku also demonstrated chinkuchi by emphasizing to his students the rising punch and kick, not only because they are more powerful, but also because they are easily more controlled. In other words, they allow the practioner to establish better chinkuchi. As Advincula tells his students, it is impossible to "fall up". Thus, chinkuchi is simply maintaining proper balance and control, at the same time, while generating bursting energy (ki) which culminates in energy focus (kime). To Shimabuku, chinkuchi meant controlled energy, which is produced when needed. Shimabuku put a great deal of emphasis on "centering" -- the ability to deliberately and instantly place all of one's energy directly beneath the navel. This results in one being completely balanced and almost immovable. Advincula claims it is extremely difficult for anyone to use your ki against you if you understand the concept of centering. Centering is best described as all energy or tension concentrated on a spot near the center of the body. This spot is called the tanden, and is located approximately two inches below the navel. Centering is the process of simultaneously forcing energy from the feet, up the legs, into the abdomen, as well as forcing energy from the neck and shoulders down through the body to collect in the tanden. This results in the body being well balanced and quite immovable. You are therefore able to control your ki and keep it from being used against you. "Chinkuchi is the essence of isshin-ryu," Advincula says. "The entire system is built around it." This is illustrated in sanchin kata, which is practiced to cultivate and control ki through proper breathing methods. Because he feels proper balance, coupled with maximum energy, is the key to victory, Advincula stresses chinkuchi when teaching self-defense and close-combat fighting. "Disrupt your opponent's ki, and you have won the battle," Advincula states. If you control not only your chinkuchi, but also that of your opponent, you control your destiny." About the author: Robert B. Safreed is a Cypress, California-based freelance writer and martial artist who trained in Okinawa under isshin-ryu karate founder Tatsuo Shimabuku.